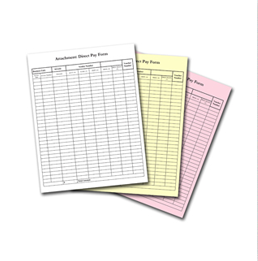 You can get your Carbon-less Forms printed in common sizes: 4.25″ x 5.5″ (quarter page), 5.5″ x 8.5″ (half page), 8.5″ x 11″ (full page), and 8.5″ x 14″ (legal). You’ll also have the option to choose between 2 parts (duplicate), 3 part (triplicate) and 4 part (quadruplicate) forms. Back to back printing, sequential numbering and padding are optional. Delft Printing provides a quick service.